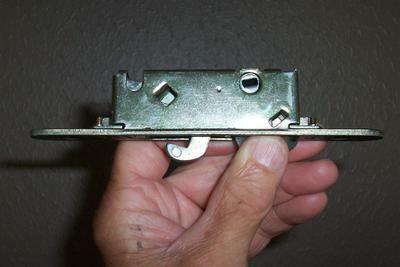 Hello, can you help me to identify the model replacement lock that I need to order for my sliding glass patio door? It looks like the 2014 but I get different measurements than are shown in the diagram. The hasp swings upward. There is 4 5/8" between the mounting holes on the mounting plate. The height of the lock itself is 3/1/4" and there are 3 3/4" between the screws which mount the lock to the mounting plate. The lock itself is 1/2" wide and the mounting plate is 3/4" wide. The distance from front to back is 1 5/16". 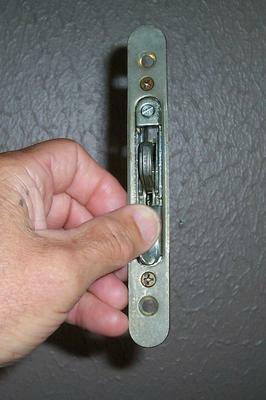 The thumb lever fits in the lock at a 45 degree angle. Thank you for any help you can give me. P.S. You may notice that the section under the hasp has been damaged. Hi Mike, Thanks for the great pictures and detailed description. Yes that is a 2014 lock mounted on an escutcheon plate. 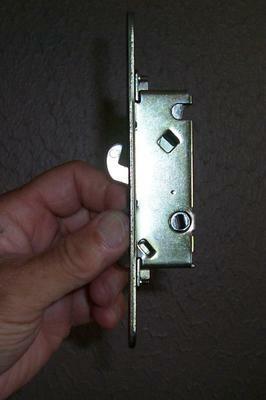 The plate is used to adapt the lock to work in wooden patio doors. You can sometimes find these locks in Lowes or Home Depot or even eBay but if you are stuck, I have a couple in stock.